With more and more people working a commutable distance from their home, pollution levels are rising as individuals use cars and public transport during rush hour. One way to positively contribute to the fight against rush hour pollution is to travel to and from work via bicycle, reducing your carbon footprint enormously. In addition to helping the environment, traveling by bicycle will shorten your traveling time, beating the rush hour traffic queues and making use of bike lanes present in many major cities. Furthermore, your body will experience twice-daily exercise, reducing your number of gym visits as you acquire your daily exercise dose on the commute. Many bicycles which are designed for the work commute are now foldable, providing additional options and easy use for you, enabling you to carry your bike onto public transport for part of the journey, storing it neatly away once you arrive at work. Some designs also feature electric functions, enabling you to use your bicycle as an electric bike for all or part of the journey. We have reviewed the five best folding bikes available in 2019, helping you to decide which folding bike is right for you. 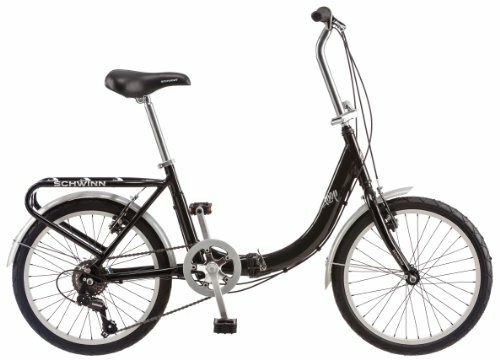 The Schwinn Loop Adult Folding Bicycle features 20-inch wheels to suit almost every cyclist in addition to a lifetime warranty, ensuring that this bicycle is a perfect purchase. Offering three different color options of white, black, or silver, this bicycle is foldable to aid easy storage at home, at work or on public transport and requires no bike rack. When ready to cycle, the size of the bicycle will fit an individual up to six-feet tall, providing enough room to ensure comfort and ease of use. In addition, the bike is durable to travel up hills and can be ridden off-rode, providing a handy kickstand when you need to take a break. Furthermore, the bike weighs around 33 lbs and features seven different speed options. Why We Liked It – The three color choices is a good feature of the Schwinn Loop Adult Folding Bicycle, enabling you to stand out from the crowd and shine on the commute. Furthermore, including 20-inch wheels for a folding bike is a strong benefit as many folding bikes possess much smaller wheels. 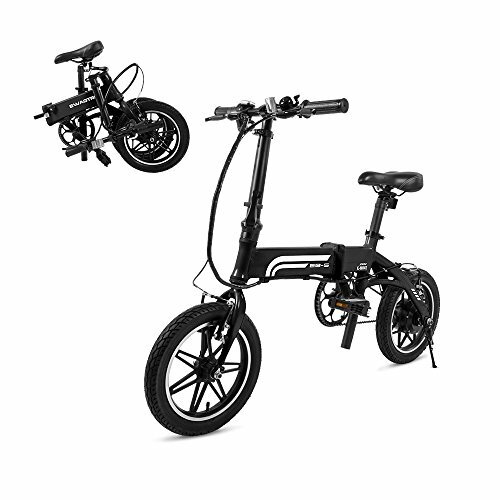 The SwagCycle EB-5 Pro Lightweight folding bicycle is a pre-assembled folding electric bicycle with an adjustable height, suitable for both adults and teens. The 14-inch wheels are practical and offer you a smooth ride whatever the terrain while the quick-disconnect brake cables contribute towards easy maintenance. Available in a choice of either black or white color options, the SwagCycle EB-5 Pro Lightweight folding bicycle provides you with a 15.5-mile range, perfect for short commutes or weekend rides. The bike folds three times to ensure easy storage wherever you need to store your bike. In addition, the bike is suitable for individuals weighing up to 264 lbs. Why We Liked It – The electric function of the SwagCycle EB-5 Pro Lightweight folding bicycle is a great feature, being able to use the bike as an electric bicycle or additionally enabling you to rest your legs when required when riding assisted. You acquire both options from this bicycle, suiting your needs each day regardless of the demands. The EuroMini ZiZZO Via 27lb Folding Bike is a lightweight design, being available in either a black or a sky blue color choice. Weighing only 27 lbs, the folding bike is a perfect size and weight for carrying onto public transport or storing in the car. The bicycle suits riders who are under five-feet tall to riders who are up to six-feet and four-inches tall. Offering rust resistant wheels in addition to seven-speed options, this bicycle is a great choice for any terrain and any weather conditions. Folding the bike for storage is quick and easy, taking only 30-seconds to complete. 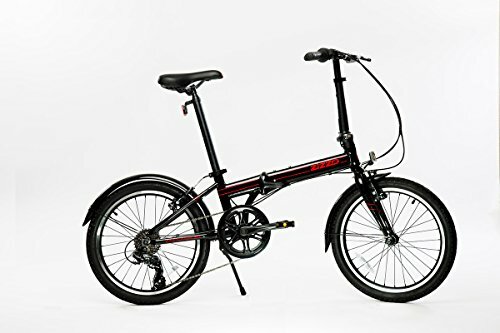 Why We Liked It – The EuroMini ZiZZO Via 27lb Folding Bike really does suit all riders’ heights, being suitable for shorter riders who are less than five feet tall in addition to taller riders who are up to six-feet and four-inches tall. The EBS Folding Bike, Commuter Folding Bicycle offers 20-inch wheels and an adjustable seat and handlebar, ensuring that the bicycle is the perfect fit just for you. The bike is available in a silver color choice or a striking green design, ensuring that you look great on your commute as you stand out from the crowd of black commuter bicycles. Providing a fashionable design with a unique retro look, this bicycle additionally folds easily to aid storage and to increase adaptability when transporting. 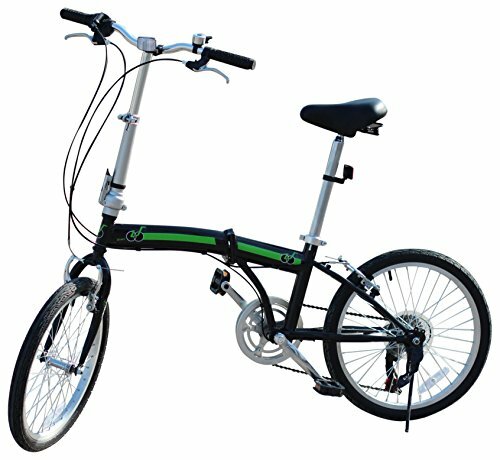 Why We Liked It – Many folding bikes are solely available in a plain black design and so the striking green design of the EBS Folding Bike, Commuter Folding Bicycle is a great feature and selling point of this bicycle. The IDS unYOUsual Folding Bike is a lightweight choice for your commuting journey. Featuring 20-inch wheels and Shimano 6-speed shifter and derailleur, this bicycle provides numerous options for you to ensure that your ride is a comfortable and relaxing experience, enhanced by the vinyl cover MTB comfort saddle. The bike easily folds and assembles with a few simple actions and is available in two different color options. + Easily assembles and folds. Why We Liked It – The Shimano 6-speed shifter and derailleur on this IDS unYOUsual Folding Bike provides a durable and efficient ride, for any terrain and weather conditions. Using a bicycle to travel to and from work daily provides numerous benefits. Firstly, the environment benefits from your use of a bike, as your carbon footprint reduces and you impact positively on pollution levels. Imagine if everyone rode a bike to work during the rush hour and the benefits that would bring to air quality and pollution levels?! Particularly if you are traveling to work alone, there really is no need to use a car. Additionally, your health will benefit as you will receive two doses of daily exercise, improving your heart rate and keeping your body in great shape. You may also save money on your gym membership, as you will no longer need to visit the gym after work as you will already have completed your exercise for the day. Furthermore, you will save money on a daily basis; once you have bought your bicycle, there are no additional costs to consider. You may have to repair or replace tires at some point in the future, but this would be a periodic cost. You will save money through not purchasing petrol, congestion charges, and parking charges, and if you do not own a car at all, you will save a fortune in road tax and insurance costs, in addition to expensive maintenance. A folding bicycle is perfect for easy storage, being able to store your bicycle away in a cupboard or even under your bed. You can adapt your daily commute so that you can use public transport for part of the journey if need be, easily carrying your folded bicycle onto the bus with ease and convenience. Once at work, you could store your folded bicycle under your desk and out of the way, or anywhere deemed suitable within your working environment. Some folding bicycles also incorporate electric functions, enabling you to either cycle manually, or let the bike do the work through using electricity, or use manual cycling and assisted cycling together to receive the best from both methods. Q: Can I commute on a standard, non-folding bike? A: Yes, of course, you can cycle on a standard, non-folding bike. The environment will still receive the same benefits, and you will still receive the same amount of exercise. However, a folding bike can provide you with so much more; bicycles are generally heavy and take up a great deal of room when storing away. A folding bicycle will enable you to fold the bike to a very small piece of equipment, suitable to be stored anywhere in the home, regardless of your storage space. You can also carry your folded bicycle onto public transport to enable you to receive flexible options, storing your bike easily away at work. 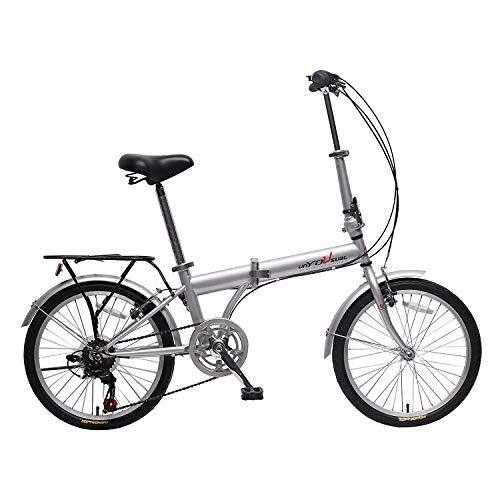 Many folding bikes are additionally lightweight, and so you will be able to carry the bicycle up flights of stairs to your apartment, easily and conveniently. Q: Can I use a folding bicycle even when I am not very fit? A: Yes! Using a bicycle to work and back every day will soon get your body fit, and you will notice improvements in your cycling capability and in your general fitness. Look for folding bicycles which also offer an electric function, enabling you to take a break and rest your legs while the electric bike takes over for part of the journey. This is also a great idea if you suffer from any minor health problems or issues. Overall, however, cycling is fantastic fitness for every individual, and a folding bicycle is a perfect companion.